Friday 11th March, Heesen's Yacht Yard in Holland, proudly presented the glorious new 55mt semi-displacement motor yacht Quinta Essentia to select members of the international press, for her official launching ceremony. The actual press conference was held on board in the main deck salon, presided over by Sergei Dobroserdov of Nakhimov, who were responsible for the original sale and management of the entire project. Also present were key members of the design team, which included Michela Reverberi - interior and Frank Laupman of Omega - exterior. Sadly, Ken Freivokh, originator of the interior design layout, was unable to attend, as was the case with Van Oossanen who, in conjunction with the Heesen in-house designers, were jointly responsible for the naval architecture. The all-aluminium Quinta Essentia is truly striking in creamy-white paint, with a contrasting deep red which has been used to cover the transom, then moves forward as a broad band through the bulwarks, almost to the bow and which is outlined with a single, narrow silver stripe. Adding to the drama are signature curved-window "balconies" for the owner's suite forward on the main deck, the main deck saloon and the upper deck saloon immediately above. In each case, the bulwarks are glazed to allow clear views of the water, even when seated inside. Internal elements are incredibly spacious and delightfully decorated in a style created by Michela Reverberi, which achieves a really livable ambience. This exceptional yacht was 'launched' this morning, by the simple procedure of flooding the dry dock in which she had been placed for finishing. For the traditional naming ceremony and an accurately cracked bottle of "bubbly" on the anchor plate, the owner had designated his favourite chief stewardess, Yanina Spatiro, formerly aboard his other Heesen Celestial Hope, who has now taken up similar duties on board the QE. Addressing the assembly, which included all the yard personnel involved in the construction, was Sales Director Mark Cavendish, who thanked all concerned for their efforts. The rest of the afternoon developed into a splendid specially-catered party with live music accompanied by the showing of Pirates of the Caribbean. Detailed finishing is scheduled for 31st May, following which Captain Rob Williamson will bring her to Capri, for the wedding of the owner's daughter. 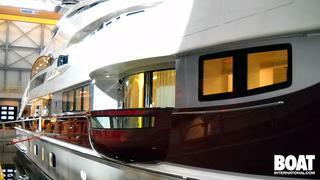 Eventually Quinta Essentia, will be available for highly desirable charter.